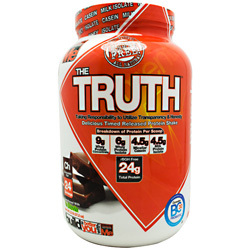 Product Description: All Natural, Gluten and Hormone Free, Taking Responsibility to Utilize Transparency and Honesty, Delicious Timed Released Protein Shake, NO Hormones, Gluten, Artificial Colors, Artificial Sweeteners, Artificial Flavors, Amino Spiking, Proprietary Blends, Deception... Just the Truth! The Truth Protein Shake is designed for 4-6 hours of protein and amino acid absorption into the blood stream to keep you anabolic throughout the day to maintain and grow lean muscle tissue. Great for anytime use and with the added benefit of GanedenBC, a probiotic that not only supports digestion and immune health but also increases absorption of 23 important amino acids including Leucine which is critical to stimulate muscle protein synthesis. Ingredients: rBGH Free Whey Protein Concentrate 80%, rBGH Free Whey Protein Isolate 90%, rBGH Free Milk Protein Isolate, rBGH Free Micellar Casein, Sunflower oil Powder Blend (High Oleic Sunflower Oil, Maltodextrin, Sodium, Caseinate, Dipotassium Phosphate, Soy Lecithin, Silicon Dioxide, Natural tocoperols), Cocoa Powder with Alkali, Xylotol, Erythritol, Natural Flavors, Sunflower Lecithin, Xanthan Gum, Stevia rebaundiana, and Bacillus coagulans GBI-30 6086 (34mg).